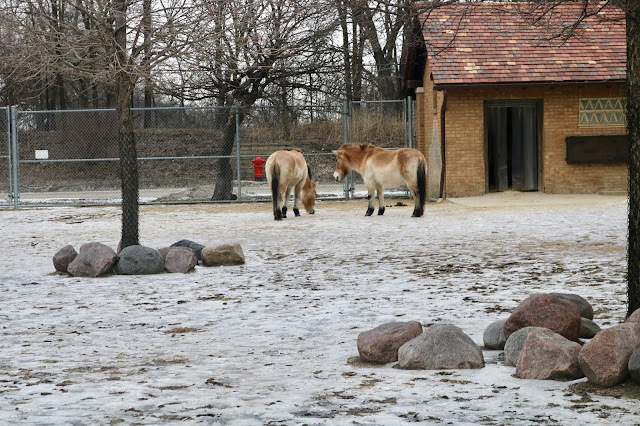 Most people visit their local zoos in the summer, but did you know visiting zoo's in the middle of winter can be pretty fun too? Sure it's cold, and not all the attractions are open, but it's worth a visit to avoid the summer crowds and get some great discounts too! On the day we visited the Brookfield Zoo in Illinois, it was a FREE day! We only had to pay $14.00 for parking. 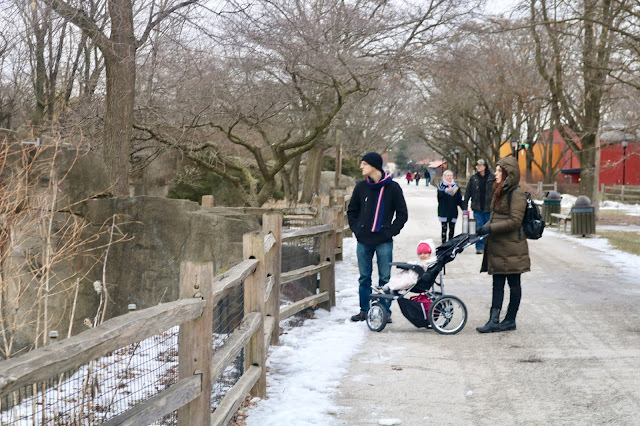 My first recommendation for visiting a zoo in the winter is to dress for it! 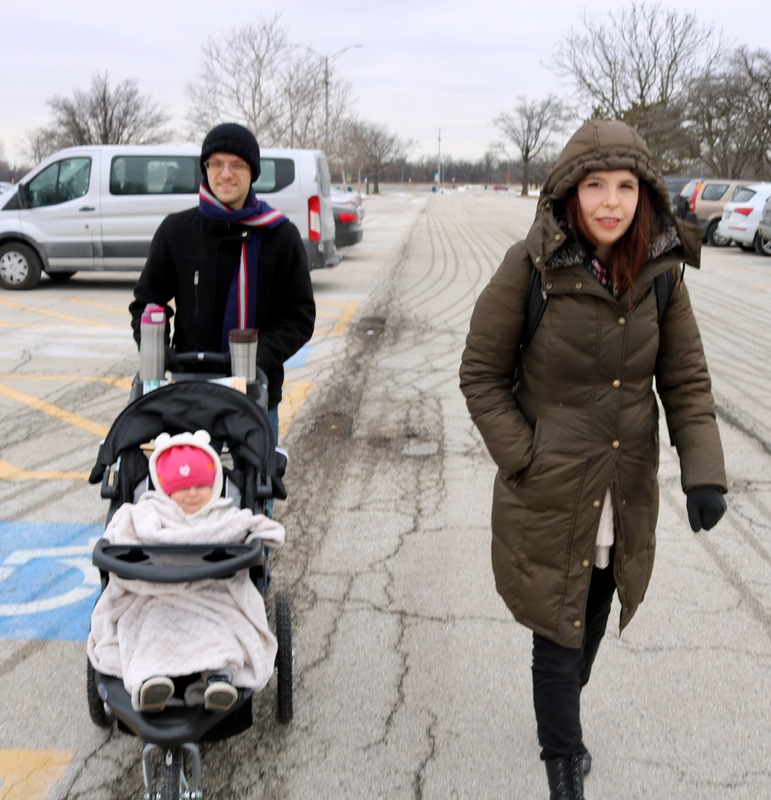 We wore our down-filled parkas, or other heavy coats, plus hats and scarves! 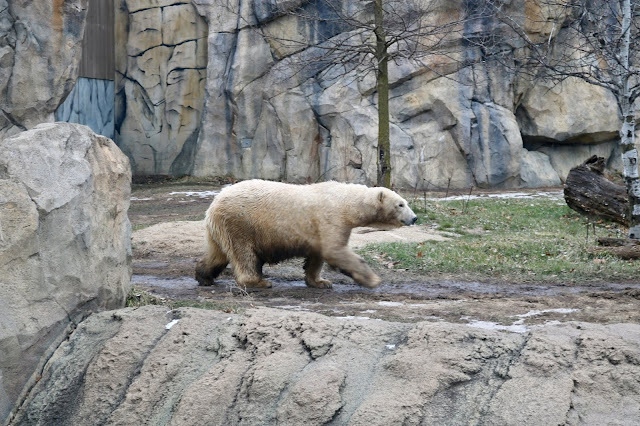 Although my children have lived in the area for years, I have never been to the Brookfield Zoo before. I was SO IMPRESSED! 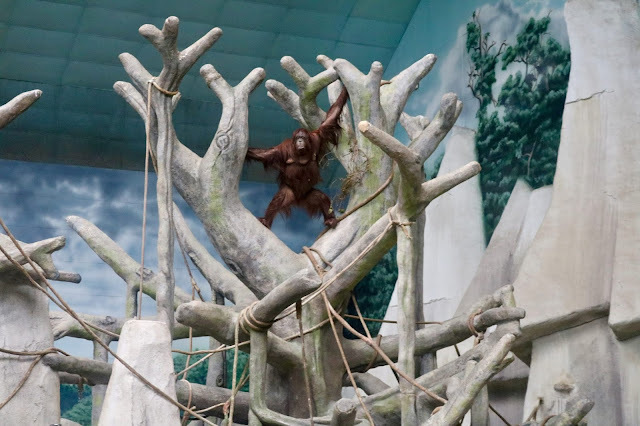 I could not believe the facilities, especially the primate exhibit. 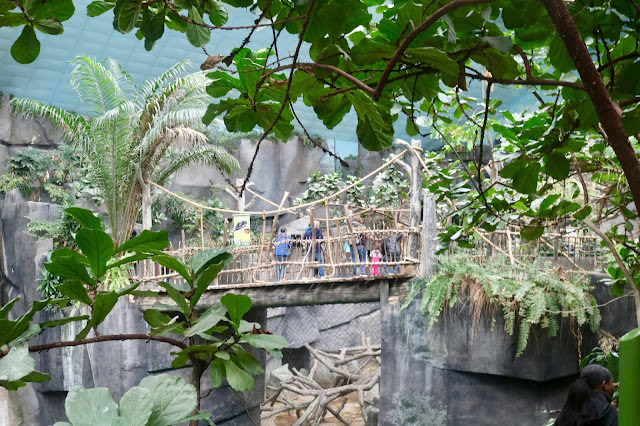 The primate exhibit was this HUGE building of bridges, waterfalls, plants, birds, and faux terrain. It was amazing! I felt I was in Jurassic World. Alethea was so happy running back and forth across the bridges and ramps. 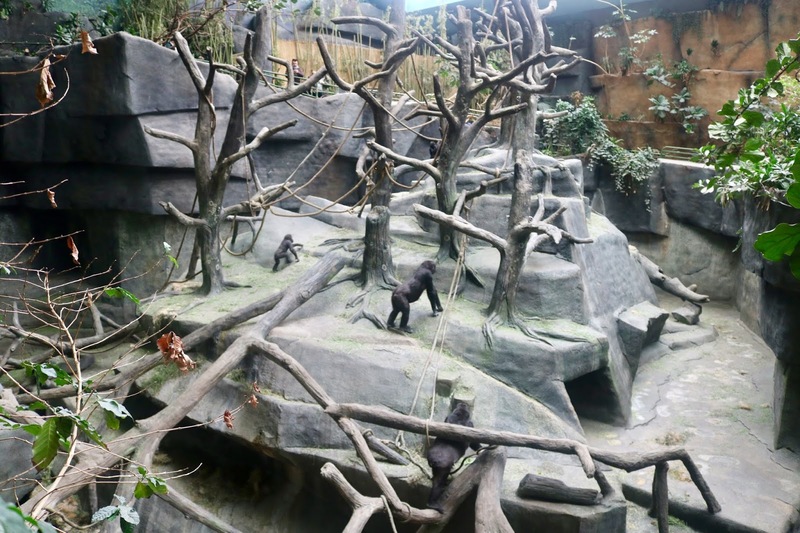 All the primates had a lot of trees and ropes climb and play on. I couldn't believe my amazing timing to get this shot of an orangutan. 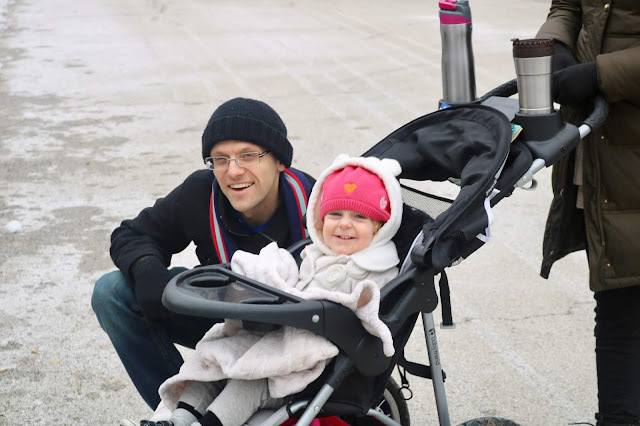 Even though it was a cold, 20 degree day, we were never outside long. Most of the animals were inside, so it was just a matter of walking outside briefly from building to building. I thought the exterior of the buildings was just as attractive and impressive as the inside! These beauties were outside, but they were huddled on the other side of a viewing area so we were able to get a real close look. 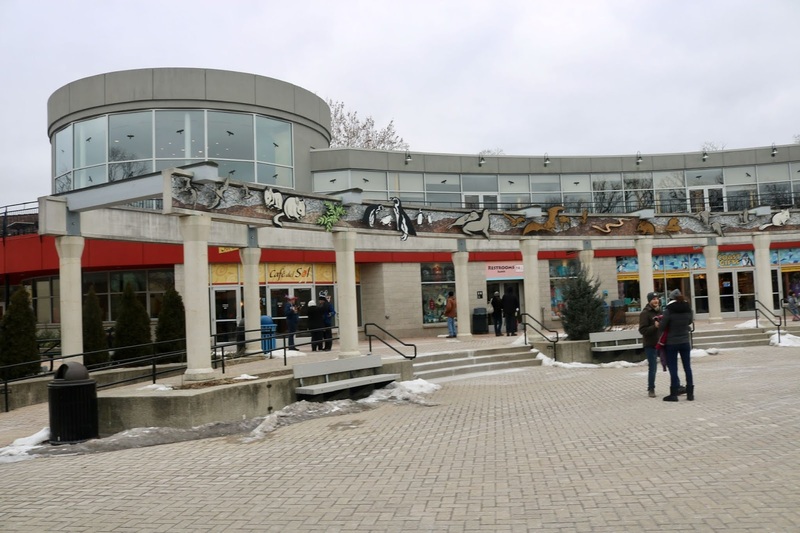 Brookfield Zoo has a ton of cafes and stores. Most of them were closed for the season, but this one food court was open plus one gift shop. I was so impressed with all the dining options. 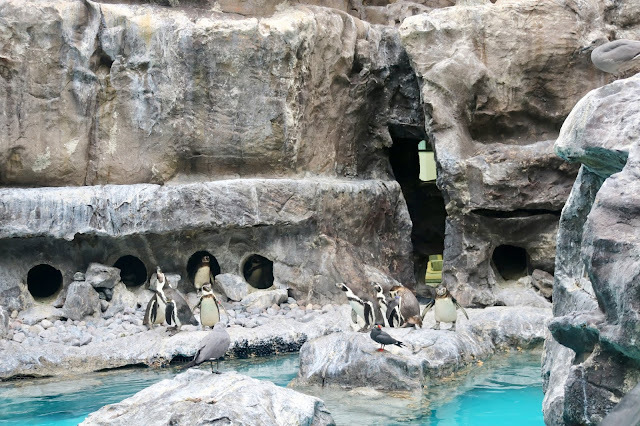 Penguins have always been one of my favorite animals. 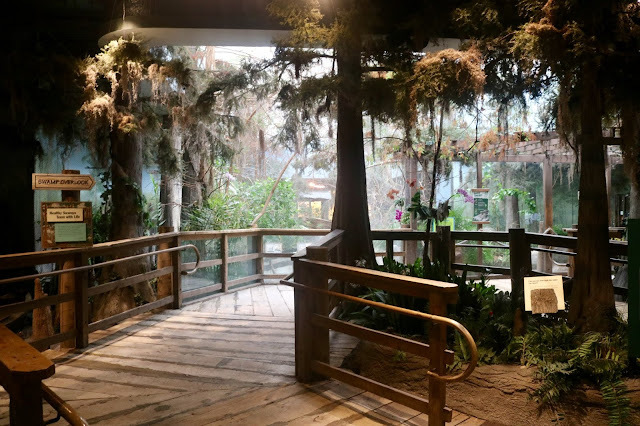 I loved this exhibit because we could get so close to our feathered friends. They do have a dolphin show at this zoo that you have to pay extra to see. There were none going on when we were there. 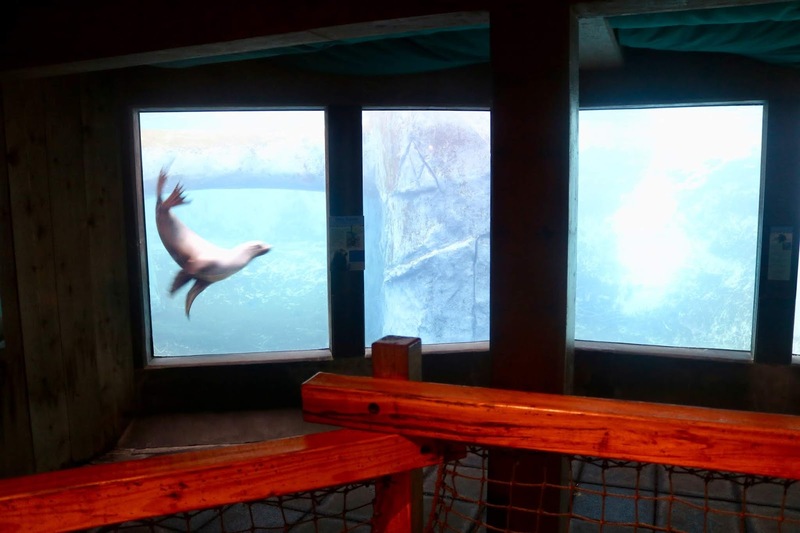 You can however see the dolphins and seals for free in an underwater viewing area. Doesn't this seal have the sweetest eyes and face? The cold didn't seem to bother the cats, cause they were all outside. 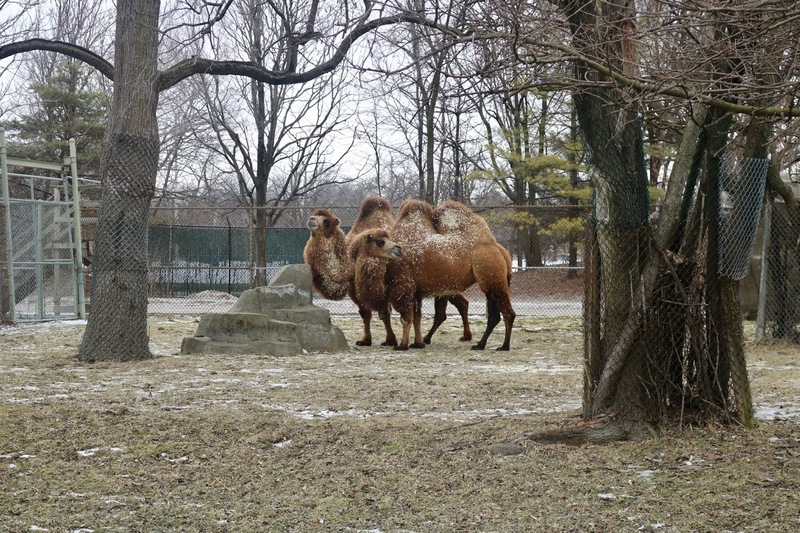 Other animals that were outside were horses, camels, buffalo, and polar bears. 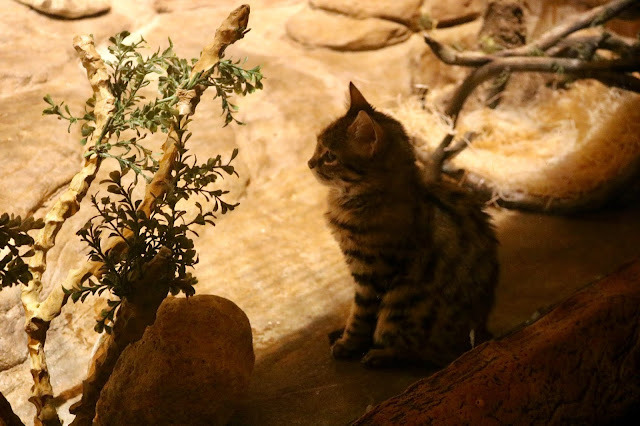 This sweet little kitty was inside an indoor exhibit. I could not believe this was a wild cat. He/she looked just like a house cat. And it was so small too! I thought it was a kitten, but it was full grown. It was so cute! I wanted to wrap him/her up in my arms and take him/her home with me. 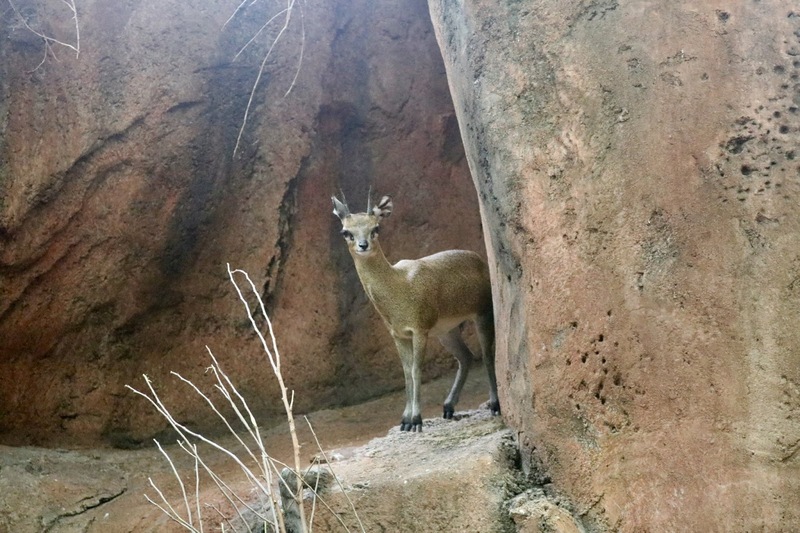 This deer stood so still, I thought it was taxidermy. Then, it moved, and I realized it wasn't. Apparently they are known for standing as still as statues. 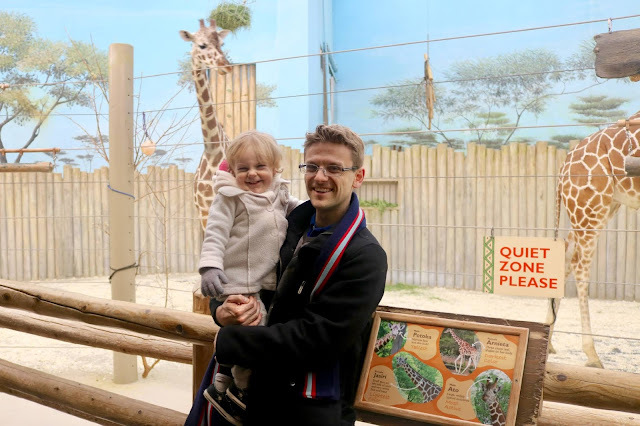 The indoor giraffe exhibit was incredible! I could not believe how close to were able to get to them. I love Alethea's laughing, smiling face in this picture. The amphibian exhibit was pretty cool too! I felt I was in a Louisiana Bayou! I know I've said it multiple times, but I really was blown away by the exhibits of this zoo. I felt like the animal exhibits looked like what you would see in a museum, but there were also live animals in them. 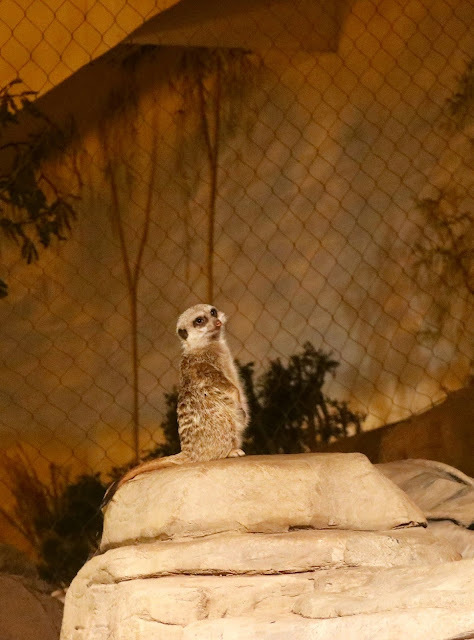 I've never seen anything like it before, and I've been to a lot of zoos! I love these little guys! Their behaviors are so cute and quirky! 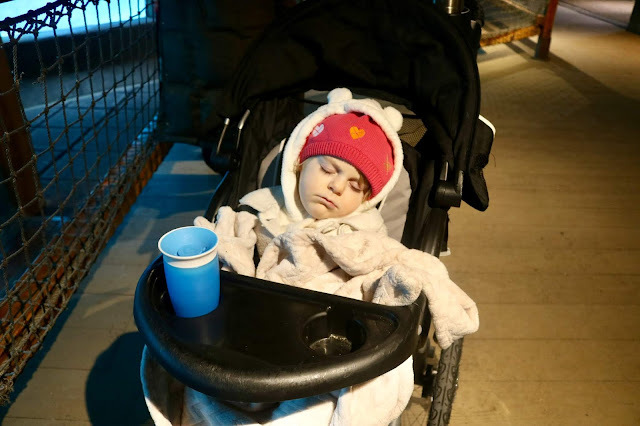 Sweet Alethea did grow tired and took a little nap in her stroller. Oh those cheeks! I can't wait to see her again and cover them up with lipstick kisses! 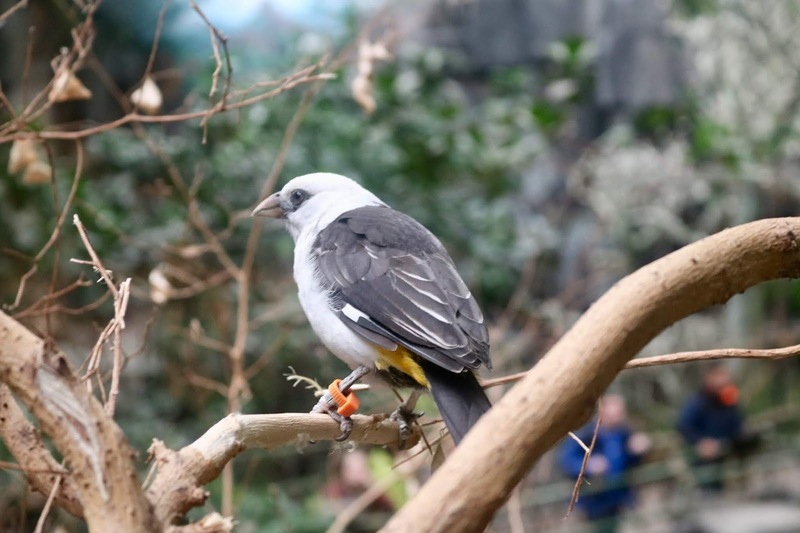 I'm a bird lover so I was thrilled to see lots of bird exhibits. But this beauty I captured in the primate exhibit. He came right up to me so I could snap his picture. 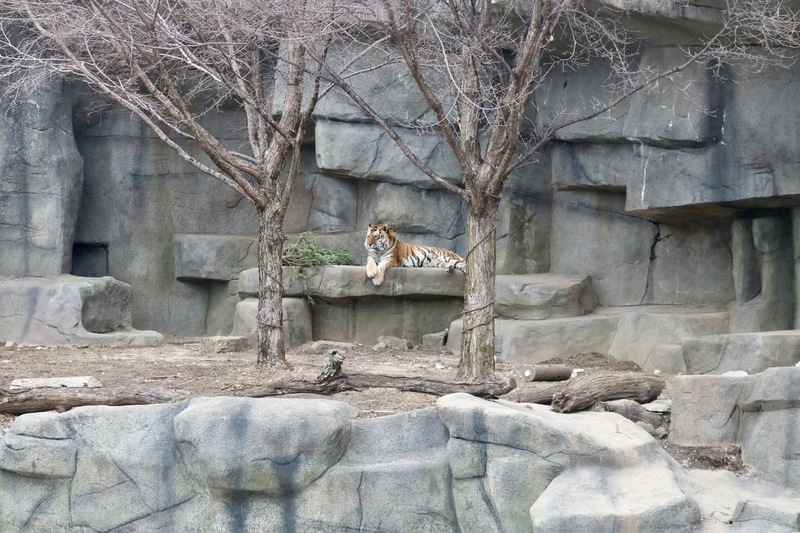 This beautiful tiger seemed to be enjoying the colder weather. One thing we noticed with all the outside animals like the tigers and polar bears, was how active they were. 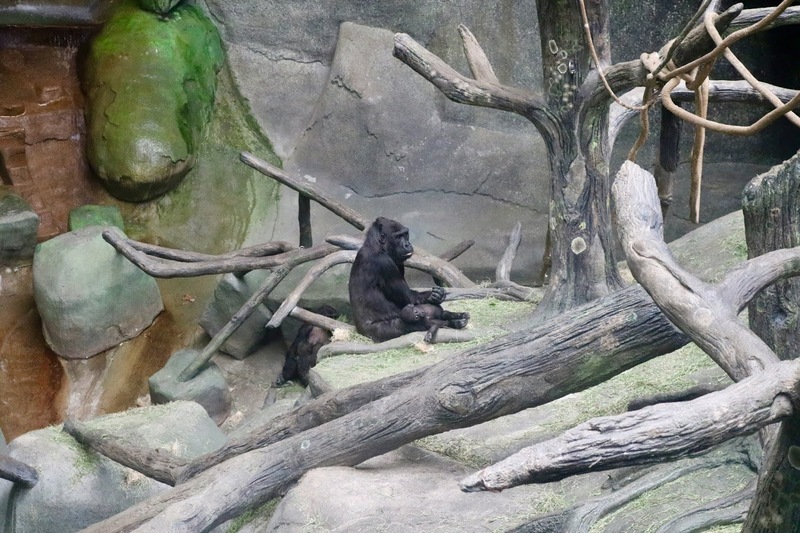 Usually when we go to a zoo in the summer, the animals are hiding in the shade sleeping. It was not the case this day, they were all very active and alert and moving around. We even caught a few cats playing. We wondered if the cooler weather made them more active. 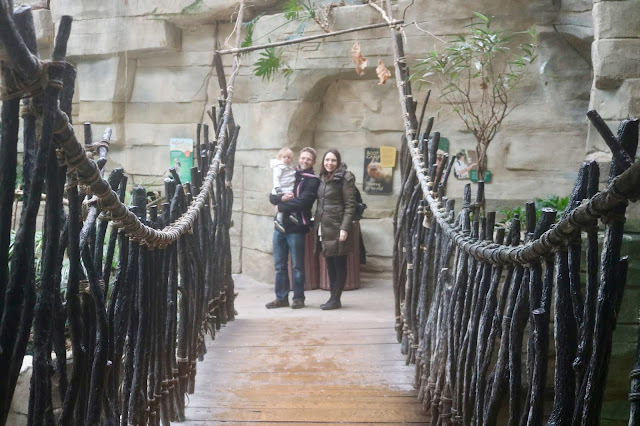 Another perk to visiting the zoo on a free day in winter, is that other attractions can sometimes be free as well, like the Hamill Family Play Zoo. 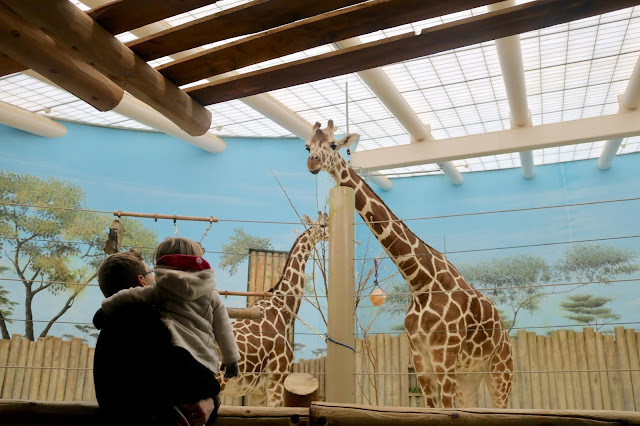 Normally you have to pay another $3.00 per person to see this zoo. 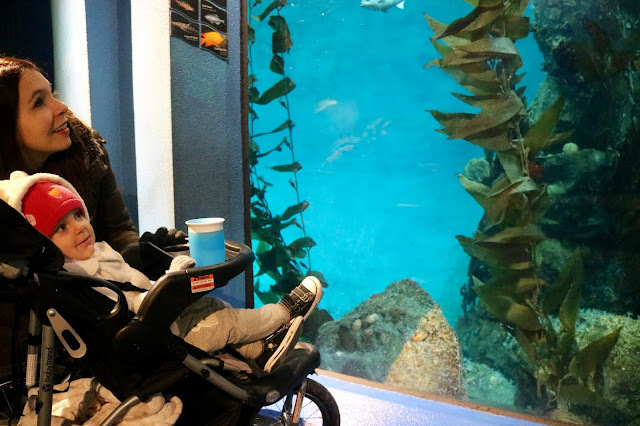 It's designed for small children under ten to have hands-on experiences. 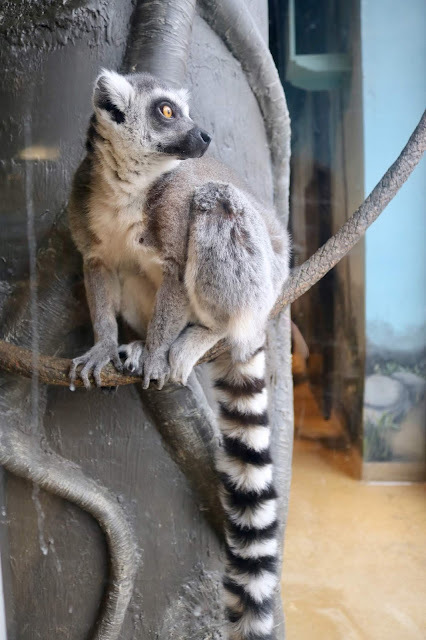 I really enjoyed the Lemur exhibit. They had the cutest costumes the kids could put on and then jump around like a lemur. 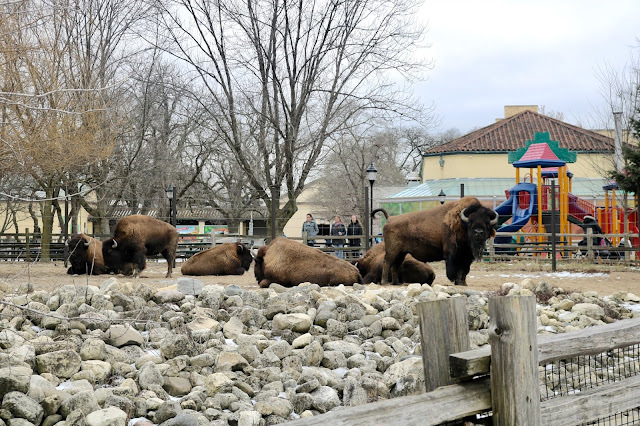 It was so funny seeing buffalo in the zoo after I saw so many in the wild in South Dakota. They also had lots of aquariums to see at the Brookfield Zoo. 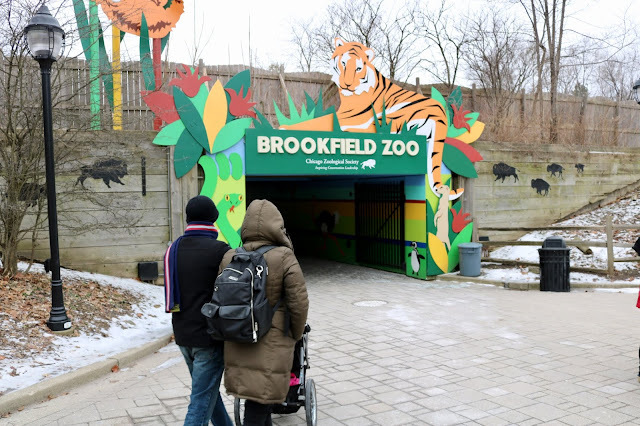 I really enjoyed my time at the Brookfield Zoo in the winter and I can't wait to go back this summer with my husband to see a lot of the attractions we may have missed due to seasonal closures....like the train! Of course, we'll have to pay all the costs and face the crowds! 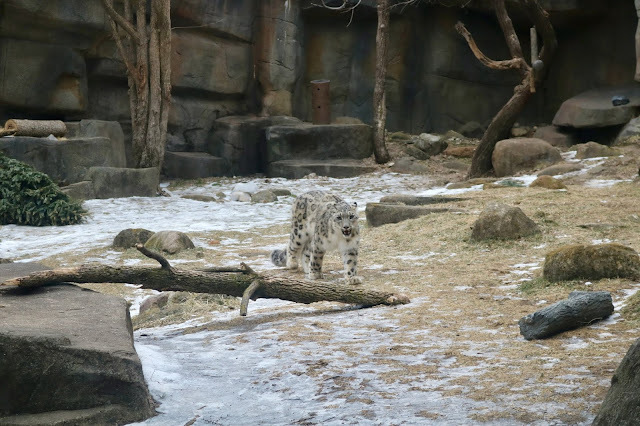 I hope next winter when you're bored and trying to think of a family friendly activity to do, you'll consider visiting your local zoo! Looks like you all had a good time and you can't beat the price! 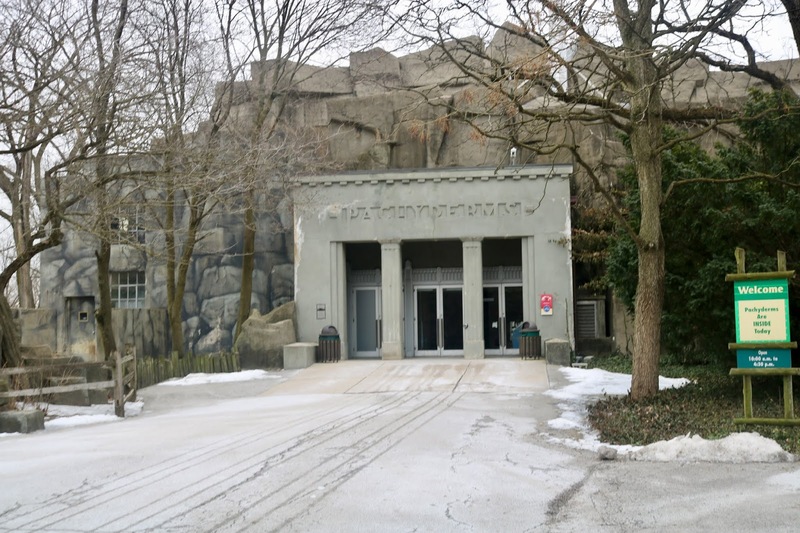 We went to this zoo about 14 years go and loved it, always wanted to go back but it's so hard to get my hubby to drive in the Chicago suburbs unless he absolutey has to. Oh that’s funny! I don’t have issues driving in Chicago suburbs but driving in the city of Chicago is another story! I prefer to take the train or have someone else drive. As far as the kitty goes, I felt so bad for him. He seemed very sad and lonely. I wished he had another cat in his pen. 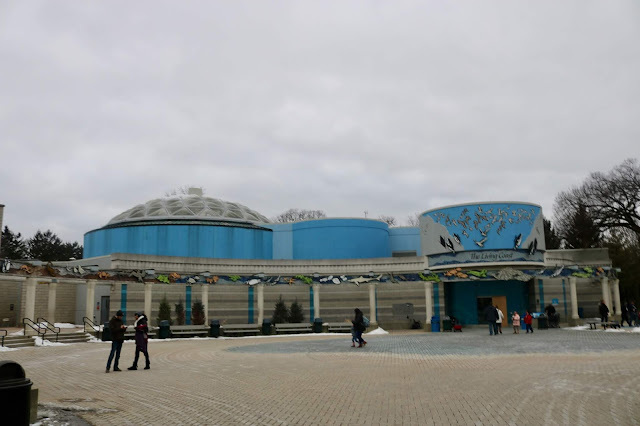 We have two local zoos; one is closed from Halloween to sometime in may but the other is open year round and we have been in the winter before. As long as it's not too cold of a day it is a great way to see so many animals without any crowds. That's awesome, yes, I love the lack of crowds in the winter. Yup! April 11 and schools are closed today because of a blizzard. Our weather is ridiculous! Someday it will be warm again. Thanks for visiting! It looks like you had a wonderful time. Young children tend to take us to places we normally wouldn't visit (I haven't been to the zoo for many years) and it lets us look with fresh eyes. I think you were all really brave going outside in that freezing weather! 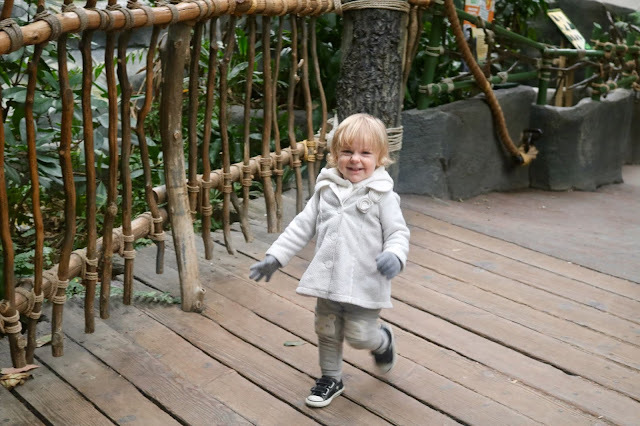 Oh, we love zoos and visit them when on vacations all the time. Having a grandchild to share the experience with is an added plus. We love zoos and always try to add one on our trips. 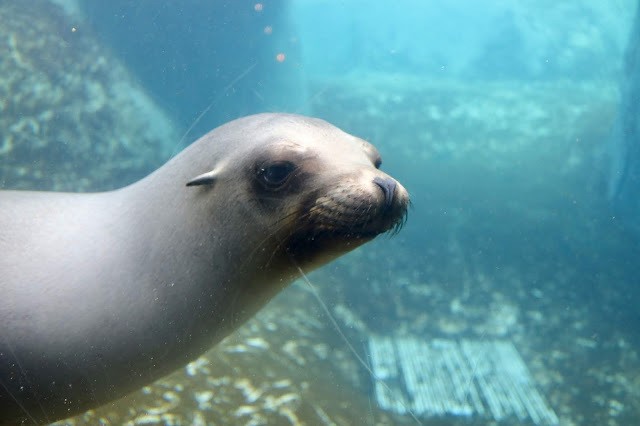 So far the Jacksonville, Do zoo has been one of our favorites. Hoping to take the boys to the Kansas city one this summer on our road trip and need to check for one in the DC area for another one of our roadtrips. Jacksonville Florida? I’ve been there, but didn’t know they had a zoo, I would have went had I known. We always try to see if there’s a zoo in the city we’re visiting on vacation too! I would love to go to Steve Irwin’s zoo! That would be a dream! What a great time! 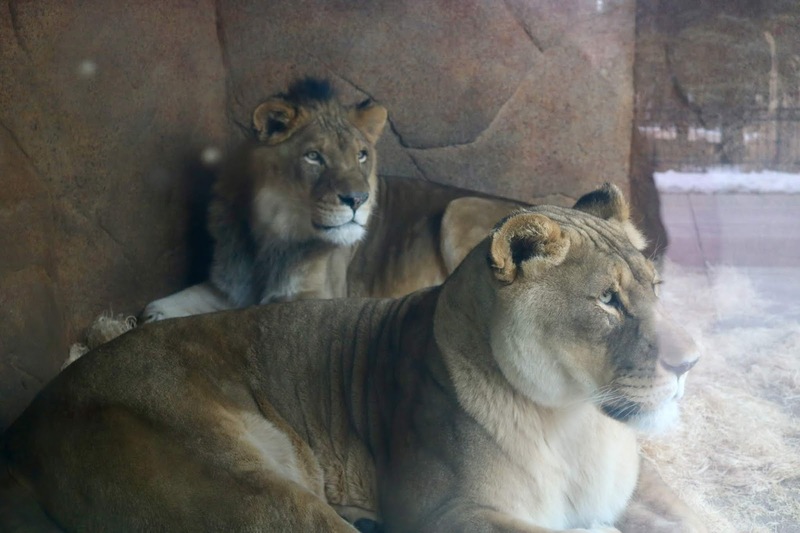 We always went to the zoo when we were looking for something spontaneous to do. You can definitely cover more ground in the winter when it's less crowded. Plus, you've got to take advantage of free admission day! Glad to read the article. Thanks for share. Keep posting. Thanks Jessica! It was a fun day.